It’s true. We recently received one of the biggest wake-up calls, thanks to the inspiring woman herself, Jenna Kutcher, who reminded us of the power of Pinterest and the impact it has on our lives. What we didn’t realize, is the impact it was having on our brand and we dedicated nearly two long weeks to a complete overhaul, which we are so excited to share with you here. 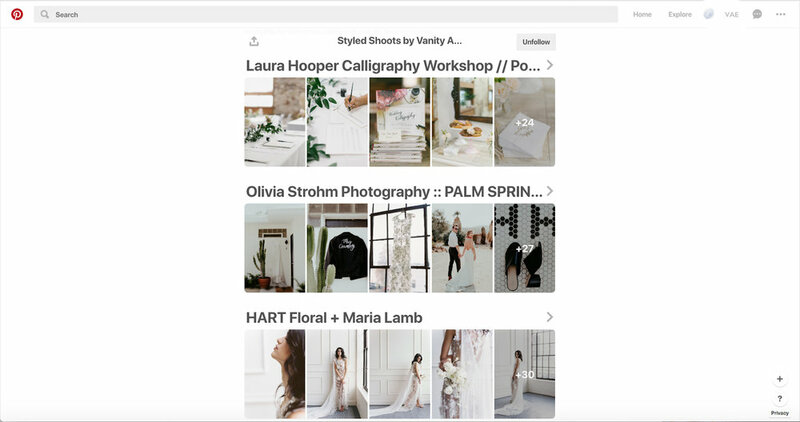 “In all, Pinners save nearly 900 million Pins about weddings and conduct 378 million wedding-related searches every single year.” – Pinterest with Deep Focus, 2016. I read that statistic more times than you even want to know, but the reality was we were missing out on being included in the 378 million wedding-related searches and we’re back for revenge with beautiful content, inspiration and much of our own work that we are so proud to contribute to our industry and the world of visual stimulation. Knowing how influential images can be during this process, we curated our page to give our audience a glimpse of who we are at Vanity Affair Events. Join us on our social media journey because we promise it is a journey you won’t want to miss! It's hard to believe that tomorrow we welcome March and Spring will soon be here. Where has this year gone? Can we travel back in time? As we slow down and reflect on this past month, we are reminded of our weekend in Carmel-by-the-Sea, California, where two amazing human beings exchanged vows and shared in celebration surrounded by their closest family and friends from all over the world. Danielle and I arrived on Thursday, assembling welcome bags, delivering to resorts for when guests checked in. It's these little details that really make your loved ones feel so special and as we hand delivered, we too felt in the joy they would soon be greeted by. We witnessed a beautiful rehearsal at Carmel Mission on Friday afternoon and sent guests to rehearsal dinner while we ironed out any last details and laid out our plan for wedding day. We enjoyed a dinner for two at II Tegamino and threw ourselves into a bit of a food coma, but absolutely worth it and highly recommend if you ever find yourself in this beautiful place. We woke Saturday morning to misty rain and by Noon the clouds parted ways and we were standing under blue skies. It's amazing how the world works and I find myself saying it more often than not. It had been pouring the entire week and here we stood with sunshine, soft waves in the ocean and dry sand under our feet. Those moments are powerful and they always make me smile. This weekend was possible because of the amazing team that we collaborated with and for clients who allow us to create and execute a design we are confident with to reflect the environment they want to see, touch and feel. Because of all of them, we did just that. On this last evening in February, we're missing those soft ocean waves and the sand beneath or feet, but thankful for where our work takes us and the relationships we nurture along the way.